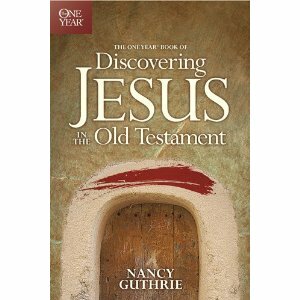 The One Year Book of Discovering Jesus in the Old Testament by Nancy Guthrie; Tyndale, 2010. Tyndale Publishing's successful "One Year" series of Bibles, and Bible studies has a new addition: Discovering Jesus in the Old Testament. The author, Nancy Guthrie, has written at least two "One Year" devotional guides in addition to at least two books on the topic of Grief. With Discovering Jesus Guthrie moves into a difficult and challenging field of study in an attempt to draw the reader into a year-long study of the Old Testament (Hebrew Scriptures) as interpreted through the lens of a Jesus-centered view. Like the authors of the Gospels and the Apostle Paul himself, Christians throughout the ages have drawn threads throughout the Hebrew Scriptures that weave their way to Jesus. Guthrie provides the opportunity for the average reader to engage in these conversations in what is described as "do-able, daily devotions." While Discovering Jesus is not the sort of book that I would recommend to someone who is bent on doing serious theological work on the subject, it is a thought-provoking and reflective collection of daily devotions that are well-written and biblically-based. Full Disclosure, I received a copy of this study from the publisher for the purpose of reviewing it. If you are interested in purchasing Discovering Jesus, you can do so by clicking on the link to the left.